Great training and lots of fun with new friends and fellow karateka from Shukokai England. GREAT NEWS FROM DANIEL! Kosokun Dai physiotherapy! Many of you have been asking after Daniel and we are glad to be able to pass on his good - and interesting - news. As many of you know, a few months ago Daniel became very ill and was diagnosed with Guillan-Barre syndrome. It is a very rare and serious illness which attacks the nervous system causing loss of muscular control of limbs (and in severe case , breathing). Fortunately Daniel's diagnosis was fairly swift but even so he was left unable to walk without the aid of a stick or to use his hands for even simple motor functions. "I would like to tell you something that may be interesting for you and your students. Physiotherapists who are helping me in my rehabilitation asked me whether I practice any sport. I answered that I do Karate. Then they asked me to show something and I did part of KOSOKUN DAI (obviously poorly given my health condition). They were so impressed by the movements involved in this kata and they asked me to practice it every day because it is perfect for my rehabilitation. I never thought that karate would help me so much for this purpose. So it is not only useful for self-defense, but also for other eventualities such as my disease. ..... The physiotherapists have recommended that I keep practising karate in the future, so I will start training again when I am back in February." ​There are so many good reasons to practice kata - and now there is one more! A fantastic training weekend with Ohshita Sensei in Vienna: Suparinpei, Tomari Bassai, Gojushiho and Nipaipo katas. Thank you to Anton Marusa and SSWU Slovenia for organising such a fantastic event. 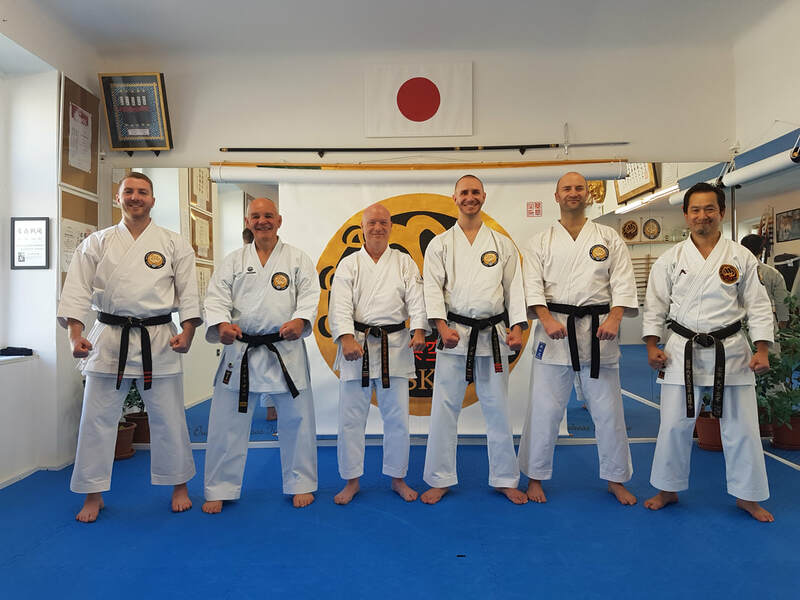 It was a great opportunity to train with Mimoto Sensei and Ohshita Sensei and a chance to catch up with old friends and make new ones too - friends from all over Europe, Japan and Australia. 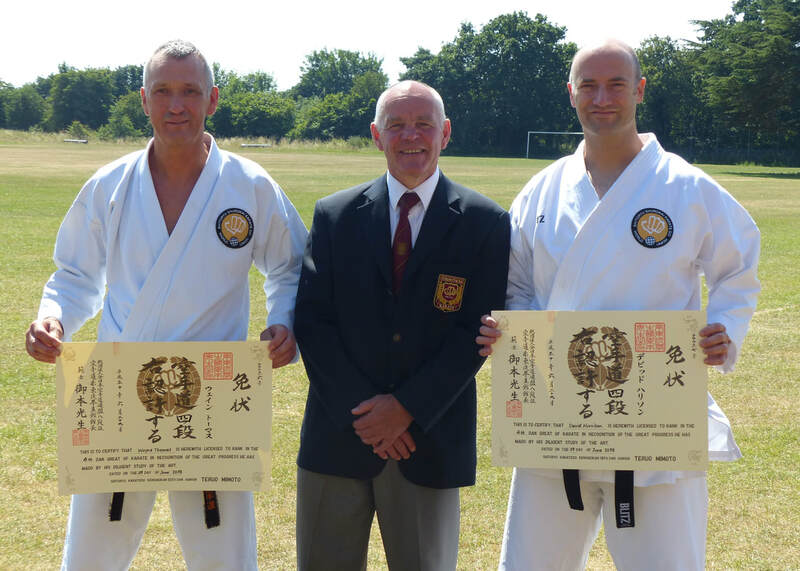 Great news for two of our club members - Wayne and Dave - who earned their 4th Dans. 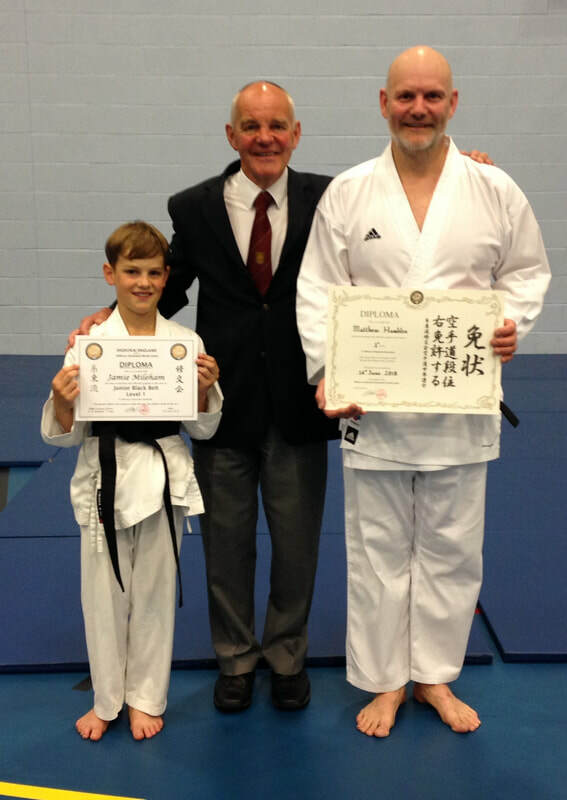 Congratulations also to Thomas Hausner on attaining your 8th dan. A highlight was seeing Yuya again - and well done Yuya on your gold medal in the kumite! CONGRATULATIONS to Matt and Jamie! Very well-deserved success. It is with great sadness that we have had to say goodbye to Yuya - for now! - as he returns home to Japan after six months with us. Having Yuya to stay with us and train with us all at our club has been a fantastic experience and many strong friendships have been forged. We all wish him well with his studies and his karate and look forward to seeing him again soon (roll on the Slovenia seminar in June!!). Kata and kumite performance were excellent - and best of all was the good dojo etiquette and sportsmanship. 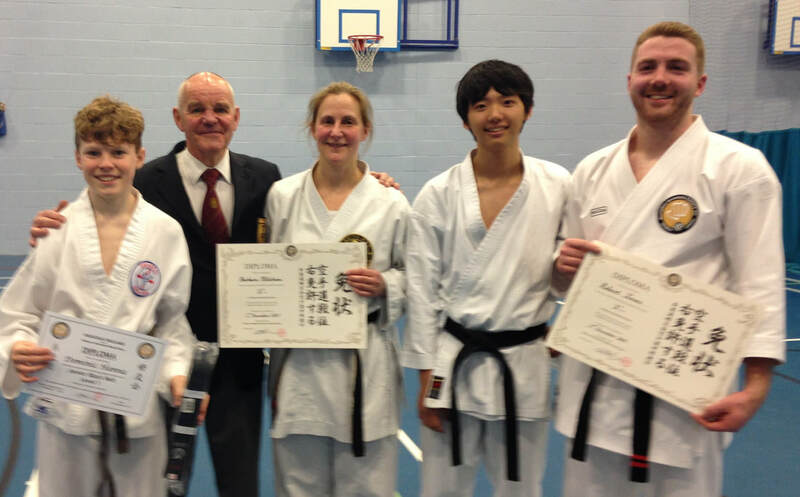 THANK YOU to our fellow Shukokai England students who travelled from Bristol and Sale to compete. And THANK YOU also to all the people who gave their time to referee and officiate at the event: it would not have been the success it was without you. Congratulations Dominic, Rob and Barbi and a big thank you to Yuya and Matt for assisting. Congratulations to Yuya, Emer and Tom - fantastic results! And thank you to Rob for your coaching and support. Well done! Here are a few images from a fantastic weekend training in Ohshita Sensei's dojo in Vienna. It was also a great opportunity to train with other members of Shukokai England from Bristol and Sale. 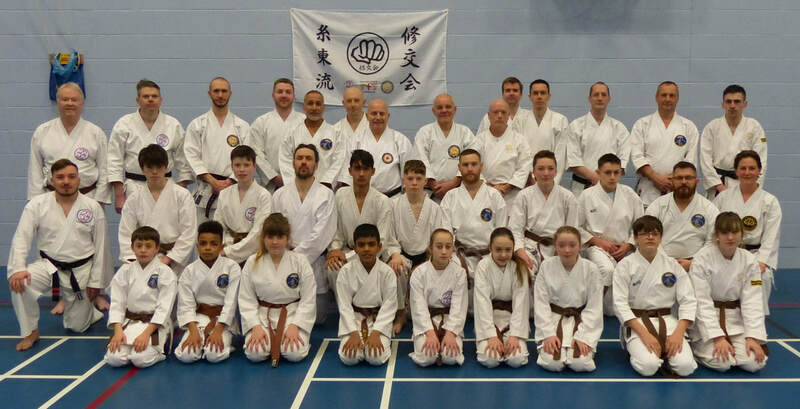 Here are a few photos from the brilliant weekend course taught by Sensei Masataka Ohshita, 9th Dan and SSWU Technical Director Soke Hanshi. We learned so much and laughed a lot and had a great time with our friends from Bristol and Sale and many others. 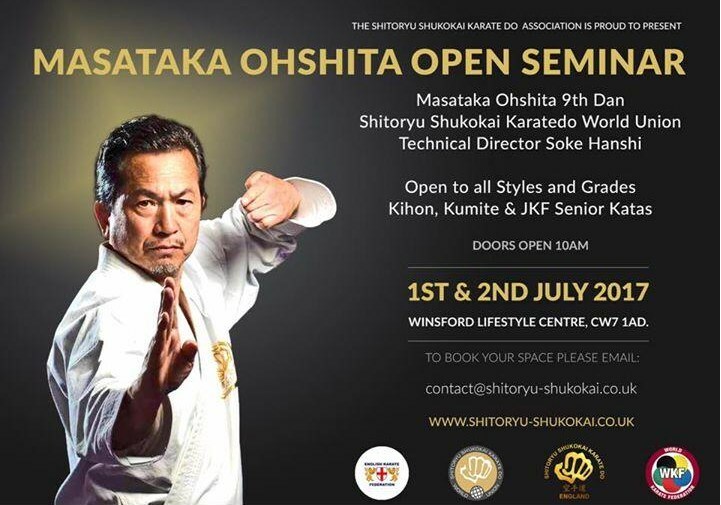 A once-in-a-lifetime trip to Tokyo to train at the Japan Karate Federation (JKF) headquarters - followed by training in Minoh City with the Kenseikan Shitoryu Karatedo association lead by Mimoto Teruo, Soke Hanshi, 10th Dan. A wonderful experience shared with our friends in the SSWU from Austria, Germany, Australia and the US. ​More achievements by our squad who performed ably both on and off the tatami. Well done! Another great performance by all who took part. Well done. The etiquette and team spirit were fantastic and it was great to see senior students encouraging and coaching the younger students so brilliantly. For many this was their first big competition ..... all the training paid off with excellent kata and kumite - and one squad member was selected as 'COMPETITOR OF THE DAY'! CONGRATULATIONS to everyone who took part in this exciting event. Squad members performed brilliantly both on and off the tatami and did the club proud. As well as great fun, it was a successful day with many trophies and medals won (two of our squad members are now SSU NATIONAL CHAMPIONS!) - but best of all was the great team spirit and the support and encouragement you all gave each other.